The D.L. 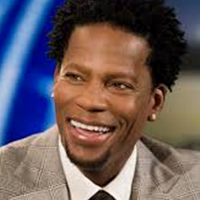 Hughley Show is a daily entertainment afternoon drive program hosted by one of the brightest comedic minds of our time.Easily connecting with today’s Urban adults through great music and lively conversations, D.L.’s unique mix of comedy and social consciousness takes listeners on an entertaining ride of no holds barred conversations that are authentic and enlightening. • Steve Wilson is one of America’s fastest rising comics. His comedic views on life, family and relationships keep the funny coming all afternoon long.